The recent storm has brought up to 90" of snow at Kirkwood, and although it was a little wet there were several places on the mountain to freefall though fresh untracked or almost untracked snow that went up to the knees at times. 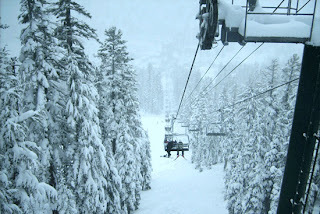 But the winds were very high and around 1:00 p.m. on Sunday the lifts to the top of the mountain closed. Still the new G3 Rapid Transit skis are holding out and proving to be very good, especially at the tight radius swing turns in the chutes and trees, an area I have always been a little hesitant on due some fear of hitting something, but hey that is why I were a helmet right?